I can’t believe that Thanksgiving is right around the corner! Not even around the corner, it's just a couple of days away! If you’re hosting Thanksgiving dinner like we are, then you’re probably cleaning and prepping for a few house-guests, not to mention planning and creating the perfect table setting for dinner! It's a lot, isn't it? Well, just in case you haven't thought about your table setting for this year's holiday dinner, not to worry, you're in the right place! To help you out, I’ve rounded up a few different ideas, so I'm confident that one will pique your interest or inspire you to create your own unique table setting. There are so many good ideas roaming around on Pinterest which only means that it's that much harder to narrow down which direction to take your table. You could choose moody and elegant, rustic chic, or modern and contemporary... or a mix of all three! It can be a little overwhelming and intimidating. But trust me, broken down, these table settings are nothing more than a few plates, glasses, flowers and candles, which makes it so easy to customize it and give it your personal touch. So let’s get inspired! Here are seven table setting ideas that we're loving for a holiday dinner. Who says that your holiday table setting has to look so holiday-ish? If you already own some classic white dinnerware, then you're already a step ahead! Instead of going through all the hassle buying entirely new items just for a table setting, use what you already have. A clean white table setting is classic and will never go out of style, plus it'll save you some time because you won't have to decorate it with all the extra holiday stuff. You can easily elevate these simple and classic pieces by adding some crisp white linens and cloth napkins. Try sticking to dinnerware and glassware that is all relatively the same style, and then add finishing touches with some special cutlery or a few small vases filled with flowers. Could this be any simpler? Copper and wood are a match made in heaven, and not only does it look great Thanksgiving, but also it also works for Christmas! There are so many different ways to go about this look, it’s hard to mess it up. Mix copper and wood accents through charger plates, cutlery, candle holders, vases, and other small pieces. Thrift stores are a great place to look accent pieces for a fraction of the cost! Since copper and wood have a similar color tone, the key is to freshen it up by adding pops of white with the tablecloth, plates, and napkins. Simple glassware will also help lighten it up a bit, so it doesn’t feel so “heavy.” Finish it up with fresh flowers and sprigs of greenery. Can I just say that I love a good moody moment? 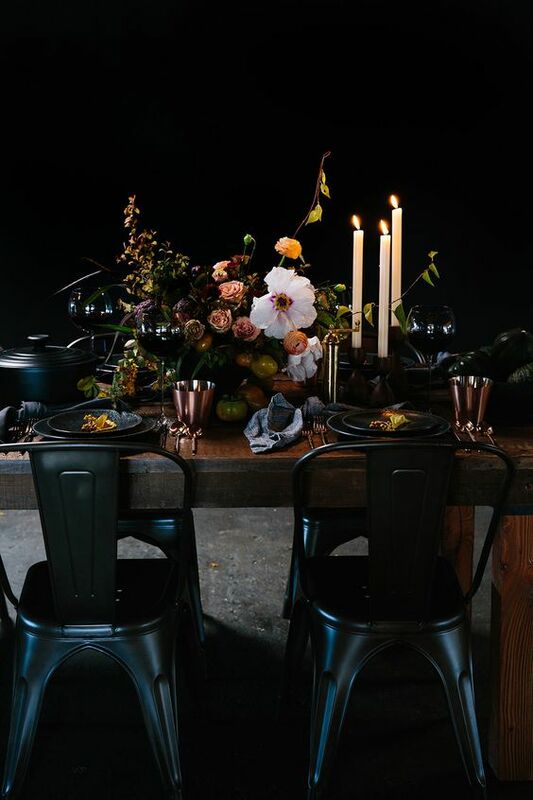 I’m totally here for the dark, moody flower arrangements this time of year, and I can’t get enough table settings that incorporate them! If you aren't the best with arranging flowers, I'd suggest purchasing a bouquet and then decorating the rest of your table around that. If you have time for that. To achieve this moody feel, add a dark colored tablecloth or use wood table as the base. Layer on dinnerware in the same dark tones and add subtle pops of color through cutlery, napkins and candle holders. To finish it up, add plenty of candles because every moody table setting needs candles! Try incorporating candles at different heights and sizes for an eclectic feel or keeping it classic with a few taper candles. Like the first idea, you can never go wrong with a crisp and clean table setting that’s styled in all white. For this one, use classic white dinnerware, but balance it out with a few strands of festive greenery or organic branches. And instead of a crisp pressed tablecloth, choose one with a more natural feel, like linen. It’s all about those subtle wrinkles, which is gives a perfectly imperfect feeling. I love a simple color palette because it makes decorating that much easier! This tone-on-tone table setting feels undecorated and organic, so forget about pressing the napkins and strategically placing each and every candle. To get this look, bring in subtle textures through the tablecloth, napkins, and flowers. Use various shades of gray, cream, and white throughout the dinnerware and charging plates. Wood, brass, and copper in complementary tones are perfect for accent pieces like vases and candle holders. Don’t be afraid to mix and match different pieces with this look because it's all about the eclectic and collected feel. Did you catch our Seasonal Edit for Summer 2018? It was all about modern terracotta, and these tones don’t seem to be going anywhere anytime soon! I love this table setting idea for a Friends-giving with a bunch of girlfriends because it’s natural and feminine. The color palette mixes terracotta tones with oranges, yellows, and pops of white to keep it fresh. This look is perfect for feeling festive without taking it literally. This last idea is all about those oddly beautiful fruits, blooms, and branches. 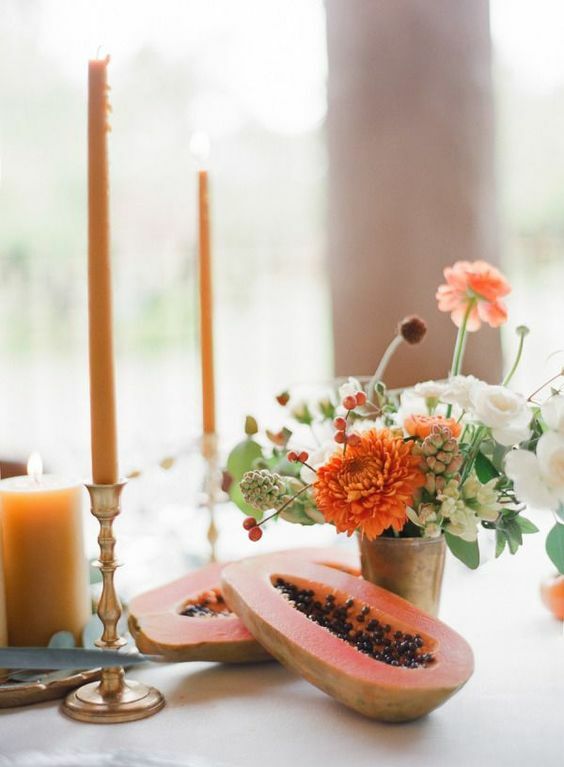 If you want to give your table setting some color, use some seasonal fruit on the table and in the floral arrangements, for a unique and beautiful look. The star of this table setting is the long centerpiece, so most of the dinnerware and glassware is kept super simple. I hope this post has inspired you to create your own unique table setting for you next holiday dinner! I’m off to finish prepping for Thanksgiving and house-guests, but if you’re looking for more holiday inspiration, be sure to check out our holiday board on Pinterest and follow along because I add new pins daily!